Regional daily journalists offered advice to community groups on getting media coverage in an event held at their newspaper’s offices. 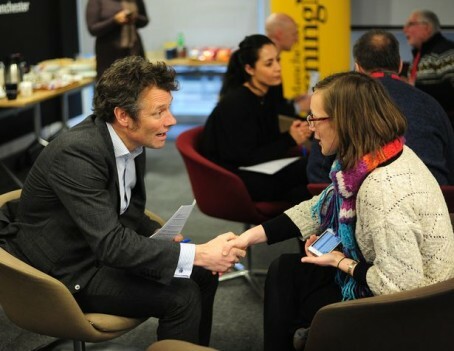 The Manchester Evening News hosted a ‘speedmatching’ event with charity The Media Trust, which allowed representatives from seven groups to meet journalists and discuss the best way to promote their projects in the press. Campaigners working across areas such as finding new public uses for old buildings, helping mothers and children, and inspiring disadvantaged and underprivileged children were invited to attend the event. Each had one-to-one sessions with MEN journalists and staff covering areas such as dealing with the media, marketing and the use of social media. Three public relations professionals also took part. MEN managing editor Paul Coates said: “We were delighted to work with The Media Trust in helping some of the many community groups in the region, many of which are working so hard to plug many of the gaps left by funding cuts. George Oliver, editor at the MEN’s sister daily the Leicester Mercury, has tweeted that his paper is also planning to hold a similar session in future. Good idea. Many people submitting copy have no idea of how to make life easier for the content editor or what an angle is. I hope they are using experienced staff. Great idea. A few professional PRs should attend, too. Waffle from this morning’s inbox includes: “Spanning seven categories, the shortlist for each award was decided following a day of deliberations by a panel of esteemed judges.” Add three emails starting: “We are delighted to announce that….” and I won’t need to explain why I’m in “Bah, humbug!” mode. In my experience you give these folks advice, on the lines that stories that get noticed revolve around interesting people doing interesting things, and they don’t listen to a word you say.